Addison Wiggin: When Janet Yellen gave her first news conference as Federal Reserve chair in March, the media pounced on her for “stumbling”; she was asked how soon they’d start raising the fed funds rate once quantitative easing was over and she said “about six months.” The market freaked out for an hour or so. But what else could she say? Imagine if she’d been honest and said, “It all depends on the economic data and whether they meet certain thresholds. And those thresholds might change another six or 12 months down the line, depending on other variables, but I can’t tell you what those variables might be. Jim Rickards: Well, Addison, don’t ever think for a minute that the central bankers know what they’re doing. They don’t. And that’s my own view, but I’ve heard that recently from a couple central bankers. I recently spent some time with one member of the FOMC, the Federal Open Market Committee, and another member of the Monetary Policy Committee of the Bank of England, which is the equivalent of their FOMC, both policymakers, both central bankers. And the evidence for this is the Fed has had 15 separate policies in the last five years. If you add it all up, all the forward guidance, all the dates, all the targets, the currency wars, Operation Twist, all the flavors of QE, 15 separate policies in five years, that tells you they don’t know what they’re doing. They’re making it up as they go along. Now, beyond that, if you look at Fed models and look at what Fed monetary economists do, they use equilibrium models. There’s only one problem with equilibrium models: They bear no relationship to reality. You can’t apply an equilibrium model to a complex system. They behave completely differently. If I say, “I’m holding a pen in my hand. I’m gonna release it, and I want you to forecast what’s gonna happen to the pen,” you’ll think about it and say, “Well, that pen’s gonna hit the floor.” And I let go, and sure enough, it hits the floor. How do you know that? You have a model. You know the pen has weight. You understand gravity. Everything about your model, which is the correct one, says the pen’s going to hit the floor. Well, the Fed has a model that says the pen’s going to float to the ceiling. If you have the wrong model, you’re going to get the wrong result every time. Addison: You circulate fairly comfortably among what the late C. Wright Mills called the power elite. On the day we’re doing this interview, you just came from delivering a talk at the World Bank. Do you get the sense that the decision makers you speak with grasp how dire the situation is? Rickards: No. Let me put it this way: They understand the global rebalancing I describe in my book, The Death of Money, the need for China to get gold. They understand that. And that’s kind of old-school central banking. That’s fairly straightforward. They get that, and they’re accommodating that. But what they don’t get is complexity theory. What they do not get are the critical-state dynamics going on behind the scenes because they’re using these equilibrium models. An equilibrium model basically says the world runs like a clock, and every now and then, there’s some perturbation and it gets knocked out of equilibrium, and all you do is you apply policy and push it back into equilibrium. So it’s like winding up the clock again, and it’s all good. But that is not the way the world works. In complexity theory and complex dynamics, you can go into the critical state. Let’s say I’ve got a 35-pound block of enriched uranium sitting in front of me that’s shaped like a big cube. That’s a complex system. There’s a lot going on behind the scenes. At the subatomic level, neutrons are firing off, a lot going on. But it’s not dangerous. You’d actually have to eat it to get sick. But now, I take the same 35 pounds, I shape part of it into sort of a grapefruit, I take the rest of it and shape it into a bat. I put it in the tube, and I fire it together with high explosives, I kill 300,000 people. I just engineered an atomic bomb. It’s the same uranium. The point is the same basic conditions arrayed in a different way, what physicists call self-organized criticality, can go critical, blow up and destroy the world or destroy the financial system. That dynamic, which is the way the world works, is not understood by central bankers. And it’s not just central bankers themselves. I’ve talked to monetary economists. I’ve talked to staff people. They look at me. They can’t even process what I’m saying. They’re like, “What are you talking about?” But the evidence is very, very good in terms of the way I do the analysis. So do they understand the gold rebalancing and the need to appease China? Yes, they do. But do they understand complexity theory and the danger they’re creating? No, they don’t. Addison: There’s a theory in the blogosphere that goes like this: Since 2008, the Fed has been paying interest on “excess reserves” that banks keep parked at the Fed. At some point, the Fed will stop paying interest on those reserves, the banks will have no choice but to lend this money to businesses and consumers and suddenly there’s a $2.7 trillion flood of currency inundating the economy — we’re on the verge of hyperinflation. What’s right or wrong about that scenario? So this is just another game. This is basically a backdoor way of financing the FDIC premiums with printed money so the banks don’t actually have to bear the cost. Beyond that, this notion that if they stop paying the interest, all of a sudden, the banks will say, “Well, we’ve got to make some money, we’ll go out and lend all this money,” I don’t agree with that at all. Here’s the real problem: To have inflation, you need two things. You need money supply, but you also need velocity. Velocity’s the turnover of money. So if I go out tonight and I buy a drink at the bar, and I tip the bartender, and the bartender takes a taxicab home, and the taxicab driver puts some gas in his car, that money has a velocity of 3. You’ve got the bartender, the taxicab and the gas station. But if I stay home and watch TV, that money has a velocity of zero. You need both money supply and velocity to cause inflation. The Fed has taken the money supply to the moon, but the velocity’s collapsing. That’s the problem. 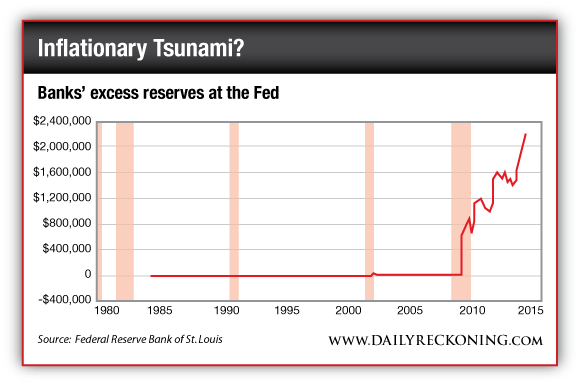 So what would cause inflation is not more money printing, or payment of interest on excess reserves. What would cause inflation now is the change in velocity, which is behavioral. It’s the change in the psychology. That’s what you have to look for, what the Fed calls inflationary expectations. I like to say that if you want inflation, it’s like a ham-and-cheese sandwich. You need the ham and the cheese. Money printing is the ham and velocity is the cheese, and you need both to get the inflation. So the thing to watch for is a change in inflationary expectations, a change in behavior. And that can happen very quickly, and that’s why inflation is so dangerous. It might not show up at all, and then, suddenly, it will come very quickly because it’s very, very difficult to change the behavior. But once you do, it’s very difficult to change it back again. And that’s why inflation runs out of control. This entry was posted in news and tagged addison wiggin, daily reckoning, economic depression, fed policy, Financial Crisis, Gold, hard assets, jim rickards, market crash, market manipulation, money printing, silver on October 1, 2014 by Site Admin.